Your sports equipment is not complete until you have your mouth guard fitted. With spring sports in full swing, Milestone Orthodontics recommends that his patients near Hackensack wear mouth guards. 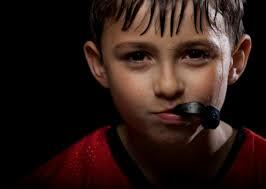 Mouth guards will cover your teeth and prevent dental injury while you are playing your various sports. Generally, mouth guards cover only your upper teeth only, but in some instances (such as if you wear braces or another fixed dental appliance on your lower jaw), Dr. Milestone will make a mouth guard for the lower teeth as well. Milestone Orthodontics is happy to advise its patients in Hackensack if both an upper and lower mouth guard is advisable to protect braces. There are different mouth guards available. The three types are stock mouth guards, boil and bite mouth guards and custom-fitted mouth guards. Milestone Orthodontics is always available to help his patients find the right guard for your needs. The most common mouth guard is the “boil and bite.” These mouth guards are available at many sporting goods stores in Hackensack area and provide a good protection if fitted properly. This type of mouth protector is made from thermoplastic material which is placed in hot water to soften it and then placed in the mouth and shaped around the teeth using finger and tongue pressure. If you need a custom-fitted mouth guard, the team at Milestone Orthodontics is available to assist you. Dr. Milestone will make an impression of your teeth and then a mouth guard is molded over the model using a special material. Because the material is more costly, the custom-made mouth guard is more expensive than the other types, but it does provides the most comfort and protection. Milestone Orthodontics also tells patients who grind their teeth that a mouth guard would be helpful to protect their teeth. This type of mouth guard is called a nocturnal bite plate or bite splint. So if you grind your teeth, let Dr. Milestone fit you with a mouth guard. Before the games begin make sure to check in with Milestone Orthodontics near Hackensack. Keep those beautiful teeth safe! !